Plastic card printing requires a routine printer cleaning as cards can have high static charges and can attract dust and dirt. 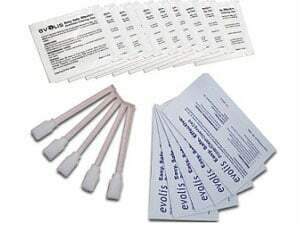 To help you maintain your printer's performance and lifespan, Evolis supplies cleaning kits to perform extensive cleaning of the equipment, which include swabbing the printhead, pre-saturated cleaning cards, and cleaning the rollers with pre-saturated cleaning, lint-free wipes. It is recommended to clean your Evolis printer every time you change your ribbon, and every time that the cleaning LED is on.